Lived a wicked witch, with her evil cats. She spent her days casting spells, on whoever did come near. On mortal man who ventured there, they would learn to fear. Her evil cats with watchful eyes would never leave her side. They always knew when strangers lurked, beyond the door outside. They would screech and make an evil hiss. And bring attention, to the wicked witch! And fly off to her other room. Where her pot was cooking, with a ghastly smell. Only there, she was prepared, to cast her evil spell! Many men did venture there, to try and catch that witch. She would turn them into stone, with just a simple twitch! It was known as a place where not to go to close. Yet, foolish ones would still go there, just so they could boost. The wicked witch would know, before they got to near. And the evil cats would warn them, that they better fear! Not one man ever returned that tried to catch the witch. One by one they met their fate, with just a simple twitch. As years went by, this wicked witch was left all alone. No longer had man tried to find and destroy her home. She needed someone to talk too; an idea was in her reach. What if she would cast a spell, on her evil cats to speak? And she prepared a special treat, to cast those evil cats a spell! This would be her downfall, like a cat that’s been declawed. The cats learned all her secrets and promised not to tell. They even learned what’s in the pot and how to cast a spell! Then one day the jealousy was among the evil cats. The wicked witch put them out and told them never to come back! Now the evil cats were homeless so they devised a plan. To get even with the wicked witch they would have to tell a man! They have to keep her from the cooking room, with that ghastly smell. And the only time this could be done, was but once a year. When the wicked witch would go outside and venture far and near. The men in town they listened, as the evil cats did speak. They all devised a plan together and no one took it light. The only problem was they did not know what night! The evil cats did listen and they told the townsmen this. The evil cats went into the forest, to keep a watchful eye. They wanted to get even and see that the wicked witch does die. Finally on the first full moon, the whole town could hear their evil hiss. As the men in town did gather, not one would want to miss. This would be a night of glory, for years they waited for. When mortal man would kill the witch and even up the score. They walked right in that run down shack, right to the cooking room. The wicked witch had no idea that her end was coming soon! They took her cooking pot, with her ghastly smell. 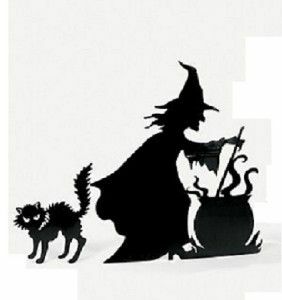 For without the cooking pot, she could not cast a spell! The evil cats got their revenge, they know her end was near. They laughed out loud together they no longer had to fear! When the wicked witch returned, the men were waiting there. The evil cats once happy, now began to shake. They could not believe the change in them, that was taking place. No longer could they speak the spell upon them gone! The wicked witch would make amends for everything she had done wrong. The townsmen tell this story, of how they won that day. The wicked witch and her evil cats had their dues to pay! Now the wicked witch and evil cats are buried in separate lonely graves. And for that little run down shack, it’s still standing there today!